Mario creates an ideal atmosphere for both formal and informal events. With 20 years of experience, he has performed for a variety of corporate events, weddings and private parties around the Ireland and Europe. Mario can provide you with top quality entertainment for your Drinks Reception, a slightly different Jazz sound available as a quartet, trio or duo with guitar, violin, saxophone, flute or double bass. With combination of Latin and Swing sound this highly professional and experienced jazz band will certainly have your guests well entertained with their combination of wonderful music. With a large repertoire of recognisable songs both jazz-latin originals and adaptations. 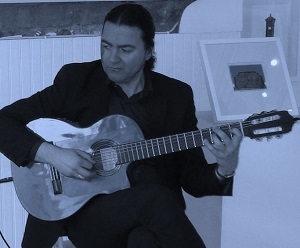 A tremendously versatile guitarist and composer, Mario is equally at home performing music from the guitar repertoire, including classical and Brazilian music, Jazz, Gypsy Jazz, Spanish and Latin music. Mario brings a touch of class to any event.